City University London has been ranked the 10th best university in the UK for graduate starting salaries. Institutions were ranked by the average yearly salary of former students, six months after their graduation. The wage paid to graduates of City was calculated to be £23,674. 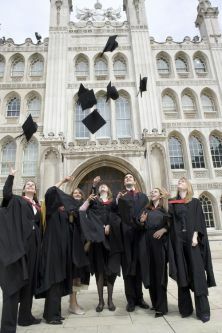 City is already ranked 10th in the UK for graduate employability by The Sunday Times University Guide 2012. The figures were compiled from data submitted by universities and colleges to the Government. The information also covered topics including where students end up working, how much they earn and the amount of contact undergraduates can expect with professors. The information will be published in full by the Which? University website which allows would-be students to build shortlists of institutions and degree choices. They can be filtered by categories such as potential earnings, entry requirements and the percentage of applicants offered places on specific courses. University applications for 2013 open this month. City University London has also continued its ascension up the QS World University Rankings, securing 327th place in the 2012 table. The current position amounts to a leap of more than 100 places in the past two years. The QS Rankings consider over 2,000 universities across the world, using six indicators including academic reputation, employer reputation and the faculty to student ratio.